That’s a great way for some people to save. But if that’s not an option for you, don’t worry. This series is focused on finding different ways to pile up Christmas money. In fact, I was able to find 7 other ways to help you fill your Christmas savings account. And the sooner you use these methods, the more money you’ll have available to you come December. When you think of it that way, why wouldn’t you start planning now?! Be sure to pin this photo to keep up with this series! Scroll to the bottom to see links to all 7 days of the series. Reasons why shopping for gifts might be stressful for you. Maybe you are struggling financially now and aren’t even sure how you will get gifts for your closest loved ones (especially the kids). Maybe you’re in debt and so tired of worrying about it. The last thing you want to do is fund yet another Christmas with a pile of plastic cards. Maybe you have so many people to buy for that you are exhausted just thinking about it. Maybe you want to have the chance to give to the needy at Christmas, but that’s just when you have nothing extra to give. If you can relate to any of those reasons, this series is for you! My hope is that this series will give you hope and eventually some peace at the thought of gift giving this season. 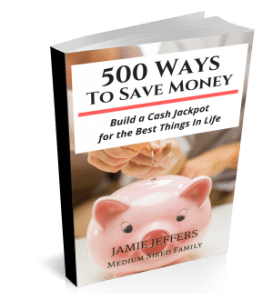 If you are looking for more money saving tips you can use now, be sure to check out my 5 Ways We’ve Saved Money This Week series. What creative ways do you save money for Christmas? If you struggle each year to find gift money, don't wait for Christmas to sneak up on you again. Try these 7 ways to fill your Christmas savings account. I am on this train for Christmas this year! I’m making a lot of gifts (for the entertainment value to me, and the handmade gift for them) and while it is true that handmade gifts can cost more, I’m trying to only shop sales this year for supplies – so far so good, and two gifts made! That’s great! Smart planning to shop the sales. I do a “crafted christmas” almost every year. And, I usually have good luck being able to do things for everyone in my list somehow. I can’t wait to keep up with this, for sure! That’s wonderful! I wish I were more crafty, but nothing seems to turn out right when I try to craft. I think it’s a great option for more talented people though. We are actually having a garage sale this weekend to make some extra money for Christmas gifts! Out with the old, in with the new (gifts)! 🙂 Looking forward to this series! Thanks for sharing! That’s a great plan! Our church is having a rummage sale this weekend, which makes it even easier to part with less loved things in order to make more space around here for better loved items. I don’t usually worry too much about christmas, but I am definitely looking forward to your tips as I am always up for finding ways to find money. I probably won’t use it for christmas presents, but I can save for a trip and consider it a present to myself! Thank you for sharing! Jamie that is what I am trying to teach my kids to do as well. To ake homemade presents for their friends, and of course I am going to follow my own advice. When you have a large family or are in the midst of an economic crisis, it’s the only option . I think it’s great that you are using that as a life lesson for your kids! There are so many ways to celebrate the holidays without breaking the bank. This is what I did to save money. I’m almost done my shopping now. It is super stressful and a lot of pressure financially though. I’m looking forward to following these posts! I don’t like the stress of waiting until the last minute. Some people are too hard to buy for, so I try to plan ahead. Thanks for sharing on #SmallVictoriesSundayLinkup! I’ve started coming up with gift ideas, but no buying yet! Sometimes getting the idea is the hardest part, so I think you are off to a good start. I hate skipping so far ahead to Christmas, but you’re right: If you want to be prepared you have to plan ahead! I’m hoping to make a lot of handmade gifts this year and not do a 24hour craft binge on my first day off in December! Gonna make a list of giftees this week. I am totally with you on the not skipping ahead. But it’s worth it to avoid the last minute panic buying and trying to craft dozens of gifts in a 24 hour period like you said! I agree, Jamie, planning ahead for Christmas is really important! This sounds like a wonderful series and I know it will help lots of people. Thank you so much for sharing it with us at the Hearth and Soul Hop. I really do hope that people find it helpful. Thanks for hosting the hop. I’ve started planning for the holidays too! We celebrate both Christmas and Hanukkah, so there are many, many gifts to think about. Once that part’s taken care of, I can relax and enjoy the season! Thanks for sharing at the Manic Mondays blog hop! Those are really good tips you shared. I always tell people that you can buy cheap gifts from 2nd hand stores and places like Craigslist. You can also make your own gifts like you said and save tons. This loos like a wonderful series! It’s really not hard to live within your means once you make a choice and every little tip helps! This is lovely, Jamie. This series is definitely needed. Thank you for taking time to share your tips! This is a great idea! And I have already been thinking about Christmas! Lol so perfect timing for me to get money-saving tips! I need this post! It seems like Christmas always sneaks up on me and I spend way too much money! I can’t wait to read through each day of tips to see how I can ease the Christmas crunch a little! Shop Target’s toy clearance for kids! This is so smart! It’s important to think about Christmas now. I usually start in October, but could easily start now. I think I will because you’ve inspired me! Thanks! “Well, you should worry about it. Because it’s coming, friends.” Haha, oh my word, that’s the most ominous statement about Christmas. I try to split up my Christmas shopping throughout the year – it’s easier to find things on sale and keeps it all from piling up into one giant expense in December. It’s not making money but taking an honest look at needs vs wants helps our grandparents on gift giving. That’s definitely a big one when it comes to saving not only money, but also everyone’s sanity!